PhD Earth Sciences, Keele University (U.K.) 'The dynamics and hazards of small-volume pyroclastic flows: a case study of the 2006 eruption of Merapi volcano, Java, Indonesia.' Supervisor: Dr. Ralf Gertisser. 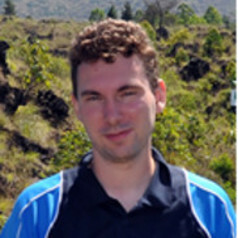 Master 1 research, University Blaise Pascale, Clermont-Ferrand, France entitled 'Earth and Planetary Sciences' and DUPV Diploma (Petrologist and Volcanologist Diploma), obtained with first-class honors. B.Sc. with Honors, University F. Rabelais, Tours, France in Earth Sciences, general mention: geology and biology.